It really all starts with sunshine and grass, this cheese thing. Just ask Mateo Kehler of Jasper Hill Farm, who wrote an article for the latest issue of Diner Journal called ‘Banking on Sunshine.’ Since time immemorial, farmers have been capturing solar power in the form of milk and turning it into the delectable dairy products we pour our granola on top of in the morning, slice onto our sandwiches in the afternoon, and savor a bite or two before or after dinner (or both!) in the evening. This week’s email is an homage to sunshine, and all we glean from it… from greens to cheese to peanut butter. The summer sun was the topic of this week’s rendition of Cutting the Curd, when I interviewed Andy Hatch of Uplands Cheese, makers of the unparalleled Pleasant Ridge Reserve. 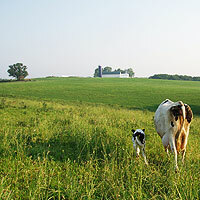 Uplands Cheese is one of a relatively small number of farmstead dairies who make cheese seasonally, only during the summer months when their cows are out on pasture. The practice mimics the ancient ritual of transhumance, when farmers lead their animals high up into the mountains in the summer time to take advantage of the abundant and varied pasture that grows there. All that verdant goodness is fodder (literally) for a complex and nuanced palette of flavor that characterizes all grass-fed cheeses. At Uplands, cheese is made all summer long, from May until October, and aged a minimum of 6 months before we get to tear into that sunshine in its cheesy form. Stop by the shop this week for a chunk of 11 month old Pleasant Ridge Reserve, my personal favorite age for this sublime alpine-style cheese. Join Saxelby Cheesemongers this Saturday, July 24th at the New Amsterdam Market for sunshine on a Sullivan Street roll as we unveil our newest dynamic duo of cheese sandwiches! We’ll be serving up one sweet and one savory cheese sandwich that are both sure to knock your socks off! For the sweet we’ve doctored up the seemingly stoner-ific but incredibly delicious combination of Peanut Butter and Maytag Dairy Blue Cheese on Sullivan’s raisin walnut rolls! Peanut butter and blue cheese?! Absolutely. After one bite your life will never be the same. For the savory we went straight for the ploughman’s lunch with Shelburne Farm’s Two Year Cheddar with Tomatillo Chutney made by Sweet Deliverance. What could complement cheddar better’n a tart & tangy summer chutney? This New Amsterdam Market coincides with New York’s ‘City of Water Day’ celebrations. Grab some provisions an hop on the ferry to Governor’s Island for a picnic and free boat tours around the harbor! And last but not least, for your weekly dose of sunshine in vegetable format (we’ve all gotta eat something besides cheese after all), you’ve gotta check out the Brooklyn Grange’s Sunday Market at Roberta’s Pizzeria in Bushwick! The Brooklyn Grange is a one plus acre farm on a rooftop in Long Island City that is proving that you don’t have to pack up and move to Green Acres to be a bonafide farmer. Yesterday farmers Ben Flanner, Gwen Schantz, and Anastasia Cole were on hand slinging NYC-grown veggies ranging from carrots and beets to snap peas, peppers, as well as a dizzying array of greens. The market is open from 11-5 at Roberta’s, 261 Moore St in Bushwick, or you can even visit the farm! Check out brooklyngrangefarm.com for directions and contact info. If this picture doesn’t inspire you to pay them a visit, we don’t know what will! ‘Till next week, eat sunshine, and be merry! < Culture is good for you!